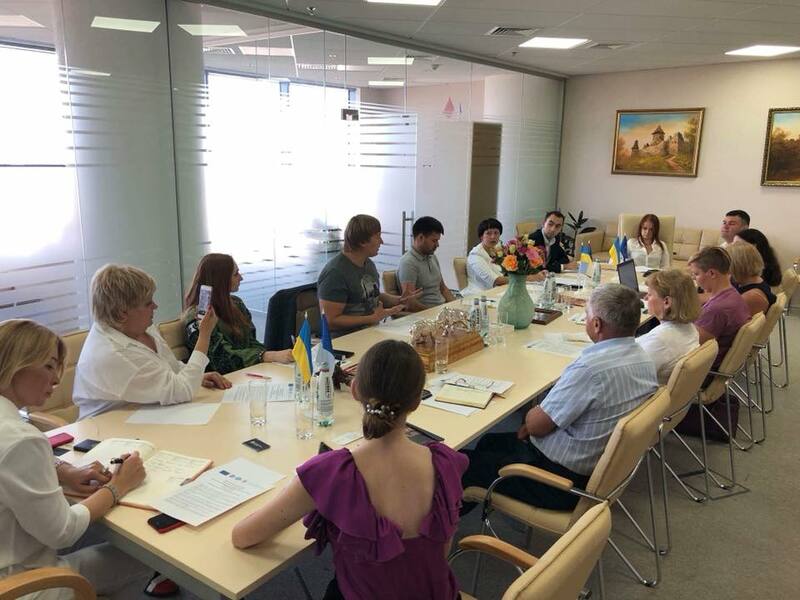 On 23 August, the Ukrainian organisations involved in “Social Partnership for Equality” Working Group 5 Re-granting Project (NGO “Bureau of Social and Political Developments”, Federation of Trade Unions of Ukraine – FTU and Confederation of Free Trade Unions of Ukraine – CFTU) met at large in Kyiv. Aside from being an official coordinating meeting, the occasion also served a wider purpose: to introduce the project to prospective partners from academic and government institutions. Among them were representatives of local NGOs, as well as the project partners from Georgia (Nugzar Kohreydze, Research Intellectual Club “Dialogue of Generation” – RICDOG) and Armenia (Ani Haratuyunyan, Armavir Development Center – AMDC). The meeting opened with an address from Eastern Partnership Civil Society Forum (EaP CSF)’s Hennadyi Maksak (Ukraine Country Coordinator), who spoke about the project in the context of the 2020 Deliverables. Rostyslav Dzundza (Project Lead Organisation, NGO “Bureau of Social and Political Developments”) expanded on this further, who talked about cross-cutting deliverables and implementation of anti-discriminatory directives in the local context of Armenia, Georgia and Moldova. Present at the meeting, Oleksandra Churkina (Deputy Minister of Social Policy on European Integration) assured the audience that “cooperation between government and civil society remains a priority” for the current administration in Ukraine. As an example, Churkina cited the draft law “On Amendments to Certain Legislative Acts of Ukraine (Concerning the Granting of Additional Guarantees Concerning the Combination of Family and Labour Obligations)”, designed to ensure social guarantees for all employees without discrimination on the basis of gender. This would allow the father to take up part-time work, at his own discretion – pending further changes to the current legislation, particularly the Labour Code. This would bring Ukraine closer to the legal interpretation found in EU member states. Olesya Bryazgunova (Confederation of Free Trade Unions of Ukraine – CFTU) highlighted trade unions’ support for European integration. Bryazgunova suggested that NGOs and trade unions should work more closely and floated the idea of creating a platform for dialogue exchange under Eastern Partnership. Natalia Dmytruk (Bureau of Gender Strategies and Budgeting) cited gender policy as an area of successful cooperation. Dmytruk, who has overseen extensive research in this field across all six Eastern Partnership countries, pointed to the existing capabilities, potential and strategies, done in National Platforms. Some of these findings will be presented at the “Gender Policies and Practices of the EU and Eastern Partnership Countries” Conference, which will be held on 11-13 October 2018 in Kyiv. The meeting continued with input from Olena Holovata (Head Expert on European Integration, Ministry of Social Policy), who talked about employment, social policy and equal opportunities in the framework of EU-Ukraine Association Agreement. Here the Verkhovna Rada must show more urgent consideration – interjected Dzundza, bringing the examples of draft laws on employment, disability and harmonisation. Closing on the Georgian experience, Kohreydze, summed up: “theme of gender equality is new and important“. “We are going to share the experience and take the experiments of other countries of the project to improve existing indicators”, within the framework of this project. “My organisation, [Dialogue of Generation]”, he continued, “is a member of the Gender Council under the local legislature and we are actively working on the promotion of gender issues”. The closing gave way to discussion on possible vectors for further cooperation – be it across different countries, sectors or institutions.